Summer is here and kids are clamoring to spend time outdoors. But what happens when it rains? This month's Staff Picks are perfect for those drizzly days spent indoors. Take a closer look below. 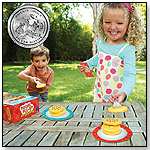 Wigglefants Stacking Game by HABA USA/HABERMAASS CORP.
Stacking up the fun with the Wigglefants Stacking Game! 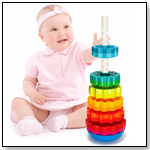 Perfect for fostering fine motor skills and problem solving skills, stacking games are both educational and fun. The adorable, brightly colored elephants can be flipped upside-down or placed right-side-up to create silly structures. The set also includes 5 double-sided, super sturdy templates that show patterns of varying degrees of difficulty for your child to recreate. 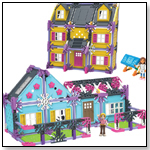 Build from the templates or create brand new structures during free play. The set includes 10 German-made beech wood wigglefants (2.70" x 2.20" x 0.70") and 5 sturdy cardboard templates. Perfect for ages 2 and up. 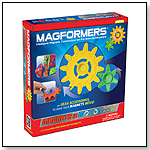 Add motion to your current Magformers set with 20 gear accessories. Easy to use, endless fun. Everyone’s favorite card game has gone sub-zero! Spot it! Freeze pits players against an electric timer and heats up the match fueled frenzy with three new games. Players race against the clock as they search for matches between temperature charged symbols, all while looking for their chance to freeze their opponents. Depending on the game, the clock can grant an advantage or cause a hair-pulling drawback. Beat the freeze to win! The handy timer opens up to store the playing cards. Bring the laid-back beach life style to your home with the Seashells TOOB®! Safari Ltd® Designer TOOBS® are sets of individually hand painted high-quality miniatures featuring vibrant colors, professional sculpting, and accurate detail. They are available in several themes, and each collection comes in a reusable cylindrical tube that slides open and closed for easy storage and transportation. The active poses and fine details of Designer TOOBS® are perfect for educational projects, collecting, and imaginative play. This set includes eight figures, including a murex, nautilus, tuba, sand dollar, turban, whelk and lion paws. Pancake Pile-Up!™ Relay Game by EDUCATIONAL INSIGHTS INC.
Order up! It’s a busy day at the diner, so don’t dilly-dally. Help your customers get just what they ordered by racing the other servers to the grill, relay style, and piling up pancakes in precisely the right order in this stack ‘em high, serve ‘em up, relay race game!